The fact that everything required to start drumming is included in the Performance Percussion kit will make it attractive to beginners. On the whole it's quite an impressive package - it is well made and the sounds it produces are pretty useable, especially with the inclusion of Remo heads. A few aesthetic features could be tightened up but the PP300R rates highly on the quality-value index and is as good a point as any to begin playing. Well-appointed starter kit with emphasis on all the right areas. More options – such as shorter toms – would improve things further. 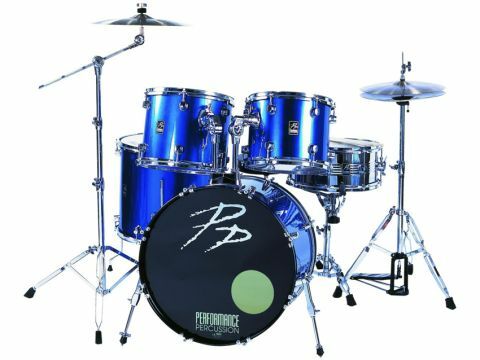 Performance Percussion is an established line of drums aimed at the beginner and educational end of the market. The Performance Percussion range encompasses kits, individual drums, hardware and a sizeable array of percussion and accessories. The PP300R kit on review represents the flagship of the Performance Percussion range and is a full size, comprehensive starter kit that contains everything you need to begin drumming. The kit is a standard five-piece set up of a 22"x16" bass drum, 12"x10" and 13"x11" toms, a 16"x16" floor tom and a steel 14"x6½" snare drum. All the relevant stands and mounts are supplied, including the hi-hat and snare stand, a boom arm cymbal stand, a chain-driven bass drum pedal and a stool. A pair of 14" hi-hat cymbals and a 16" crash provide metallic accompaniment to the drums and the package is completed with a pair of sticks and a drum key. All the kits sport double-braced tripods and while there is only one choice of kit configuration, four different coverings are available, namely Gloss Black, Metallic Red, Metallic Blue and Metallic Silver. The PP300R kit is sourced from China - the shell wood is unspecified but the shells are competently made. They stand at six plies deep and the bearing edges are accurately cut. Inside, the shells have been evenly sanded in a consistent manner. The steel shell of the snare drum contains four lines of beading and is polished to a shiny finish. "The snare was the most impressive drum of the kit without a doubt. At 6½" inches deep, it has a head start on the more typical 5" snare found at this level. Its superior depth affords a crisp, rock solid authority that is totally at odds with its budget status". The lugs are a commendable detail worth drawing attention to - where you might expect to find clumsy or weighty shell architecture there are instead rather neat low mass lugs that wouldn't look out of place on kits costing a good deal more. The distribution of lugs is not bad either. The toms are all furnished with six pairs (fine for the 12" and 13" toms, not great for the 16" floor tom) while the snare and bass drum contain eight per head (the snare's double-ended lugs means it technically has only eight as opposed to the bass drum's total of 16). This concentration on the tuning abilities of the snare and bass drum is quite right, and it is only the 16" floor tom that is underequipped lugwise in any sizeable way. The pressed hoops are par for the course and seem up to their job. Likewise the generic tuning rods worked without complaint when assembling the kit and held tuning while testing it. For the PP300R, Performance have chosen Remo heads. This is an area that conventional budget kits often treat as an afterthought and, as the choice of head makes an enormous contribution to the sound of a drum, it´s certainly a good move. The Remo heads on the toms are clear, single-ply examples that bring more focus and attack to the drums. The toms could still do with being an inch or two shallower - their deeper dimensions make for a fairly thunderous response. We can´t imagine any fledgling drummer complaining though. The bass drum is equipped with a pretty decent batter head, which sports a muffling ring. The ebony front head is thinner than that on the playing side, but contains a port which is handy for folding in dampening material - not that it requires much. The drum gives a thoroughly respectable performance. Tweaking the tuning brings about a tight, punchy thud that is destined to have the neighbours banging on the wall. The snare was the most impressive drum of the kit without a doubt. At 6½" inches deep, it has a head start on the more typical 5" snare found at this level. Its superior depth affords a crisp, rock solid authority that is totally at odds with its budget status. The supplied cymbals are unbelievably trashy-sounding. They are not unusable, but raising a young drummer on such sounds would surely instil in him or her a sound palette not unlike that of Terry Bozzio's. If the esteemed Mr B were to hear these cymbals while walking past your house he would probably be at your front door in the blink of a flam offering you cash for them. They're that trashy. The stands and pedals are all more than adequate, particularly for a kit so competitively priced. The stands feel strong and stable while the pedals work efficiently. There are nice touches throughout, such as the high quality clutch on the hi-hat stand. The Pearl-style tom arms have memory locks at both ends and perform reliably. Likewise the telescopic bass drum spurs contain retractable spikes that keep the bass drum rooted to the floor, even if the kit is unlikely to ever venture any further than your bedroom.